Check out the latest videos of the game in action! Check out the Mario Bros. in action! Nintendo were kind enough to send us over two brand new gameplay videos of their upcoming DS release Mario & Luigi: Bowser's Inside Story in action. As you can see in the videos below, the game looks absolutely amazing. 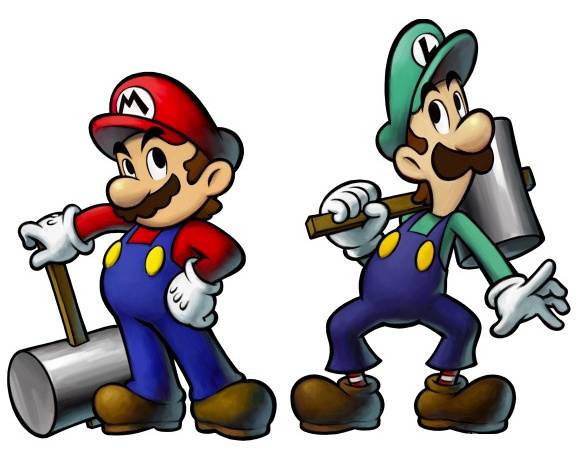 The first video is Mario & Luigi Gameplay and shows off the two Mario bros. working as a team to take out enemies in the game. The second video is Being Inside Bowser and gives a unique look at what it's like to take on the game from inside the big guy. We'll have more information on Mario & Luigi: Bowser's Inside Story as it becomes available, as well as a full review when the game hits stores this fall. Looks like another cracker of a game, much like the first two. Awesome, just totally awesome, the first 2 were absolutely well done, it makes me pine for a Wii version of this great series! Looks great and I anticapate it! One of the few DS games I like to get. This is easily one of my most anticipated DS titles of the year. I love the previous Mario & Luigi titles. I'd be angry all the time if I had all those baddies living inside of me as well. Looking forward to this one! hate being dsi-less... looks great! @derk711: don't worry, it's not a DSi-only title. Saw these on IGN yesterday. Looks awesome, very much looking forward to it. This game looks pretty awesome. I'll get Scribblenauts first, this second, and Kingdom Hearts third. That's all on my DS front. I already pre-ordered my copy. Now I can not wait. im getting this and scribblenauts! It looks great, objectively speaking... but I've always been disturbed by movies / scifi episodes / etc in which someone journeys inside the human body. To be fair, the Futurama episode where Fry contracts the worms is one of my favorites, but only a few minutes of that episode take place inside his colon, and I just don't know about getting through an entire game within Bowser's body. I'm looking forward to this and Kingdom Hearts 358/2 Days. What is the release date? This is out in Japan right? Does anybody know whether the Japanese version has English text? Nothing good is out here on DS until the end of the year so I want to get this now. I like M&L, but to me it is far inferior to the paper mario series. Whether its turn based or an action RPG, I want a sequel, (on ds it would be nice . Anyways I think this is a great year for Nintendo games. Anyway, lookiing good. I cannot wait for this. The two Mario & Luigis are two of my favorite RPGs of all time! i'vo got the first two games in the series and i'll buy this one. superb, but... too short. or not? I'm getting this one alongside Scribblenauts even though I'll still be busy with Metroid Prime Trilogy. Not to mention getting Muramasa: The Demon Blade the previous week and school work....Anyone know if Mario & Luigi comes with a preorder bonus? Why did I watch these videos? Now I want it even more!!! Looks good, but I've only seen side-scrolling. I also see they're bringing back Bros. "Items." That's a downer. Handheld games are just usually so blah!! but mario is usually good no matter what and this looks good,but this game would have been so much better on the wii instead of the little kiddy ds crap. What's with the DS love lately? Looking forward to this and Kingdom Hearts as well as Golden Sun, although I never finished the second one. Same goes for Mario and Luigi: PiT.